I’ve had a full week and it’s only Wednesday. Monday included a work-related day trip to Chicago for a neurosurgeons conference. Tuesday began with an early morning breakfast with the PR agency assisting the Nature Valley Grand Prix’s media relations efforts. That meeting was followed by an afternoon of frolic and fun caused by a top-level management reorg at The Company. Today, Wednesday, has found me inundated with executive management bios that require updated – caused by yesterday’s news. I guess the saying, “That’s yesterday’s news,” sometimes DOES impact the world longer than we’d like it to. On a non-work-related note, tomorrow, May 1, marks the beginning of National Masturbation Month. I’m not even going to touch that one. Well…not today anyway. Clinton is begging to go head-to-head with Obama in an Lincoln-Douglas style debate (no moderator, just questions and answers for 90 minutes). What an ideal way for Obama to shine in the spotlight and put this fiasco to bed once and for all. Winners take hold of the win when it’s in their grasp. Hillary is putting herself out there. Obama can’t turn away from this invitation to smoke his rival. Grab the victory, Mr. Obama. For avid and rec cyclists, there’s no shortage of information available in the blogosphere. One of the more popular stage races in the country, the Nature Valley Grand Prix, has launched a couple of very informative blogs designed to clue in readers about how to improve their own cycling abilities as well as a blog written by pro riders that give insight into the strategies and behind-the-scenes look into stage racing. TRIA Orthopedic Center’s Your Cycling Blog: TRIA Orthopedic Center’s Your Cycling Blog features the kind of information all cyclists can use to improve their own cycling, from training tips and nutrition to gear suggestions and much more. Novices and experienced cyclists will gain insights from noted sports and health professionals, including TRIA Orthopedic Center staff physicians and physical therapists. Other contributors include, Larry Foss, the USA Cycling National Team’s massage therapist, Stephen McCarthy of Gear & Training and Dan Carey, a professor of exercise physiology at the University of Saint Thomas as well as a former New York Mets pitcher. tactics and war stories from the top cyclists and team managers in North American cycling. Fans can feel the thrill of riding in the peloton of a USA Grand Tour ­from a racer’s perspective. 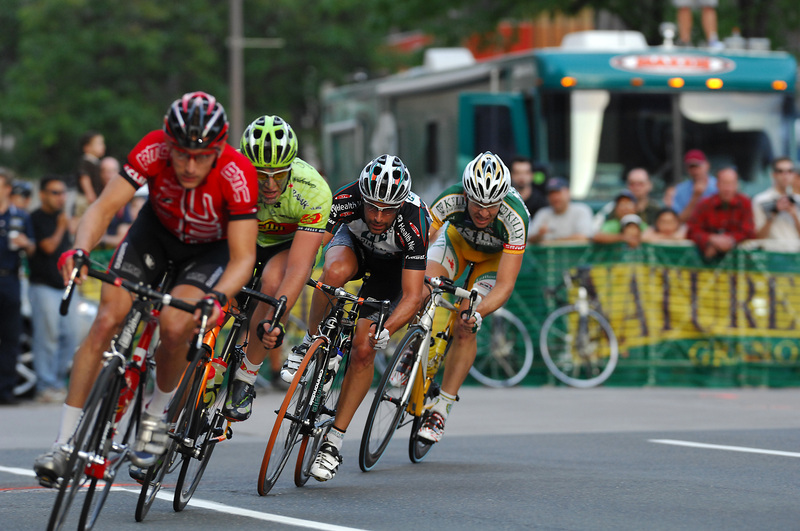 Pro Cycling Minnesota contributors include team directors, Giana Roberge and Jeff Corbett, racers John Lieswyn, Teresa Moriarty, Meredith Miller and more,. Visit these blogs early and often – and plan to attend the Nature Valley Grand Prix, June 11-15. I didn’t realize that I had a very literary cat. Sawyer, one of the best cats on the planet, came to me from the local humane society about two years ago. I could have gotten a dog, which would have breathed dog breath all over the house and eaten portions of shoes and furniture…and garbage. But instead, I picked out Sawyer. 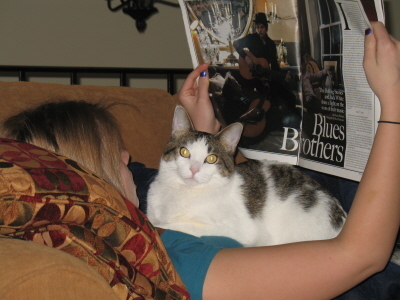 1) Sawyer catches up on the latest music news in Rolling Stone magazine – with his favorite girl. 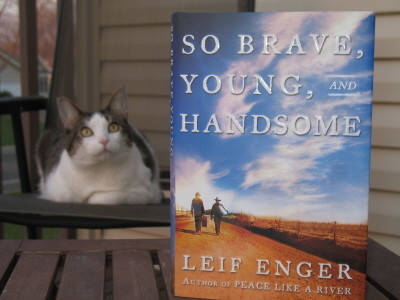 2) Sawyer prepares to read the newly released, “So Brave, Young, and Handsome,” by Minnesota-based author Leif Enger. It just arrived in my mailbox. For a divorced dad who is nearly 43-years-old, being nice isn’t the worst thing I could be. However, in my rarified dating and post-divorce relationship experiences, the adjective nice doesn’t seem to make a lot of women swoon. So I’m asking you, my female readers (all two of you…that’s an approximation), what adjectives do you prefer to think of when thinking of the man who is most likely to make you breathe a little shallower, feel a slightly dizzy when you catch his eye, or make you weak in the knees when he brushes up next to you in the proverbial checkout lane. I really want to know. Enlighten this “nice” guy, won’t you?